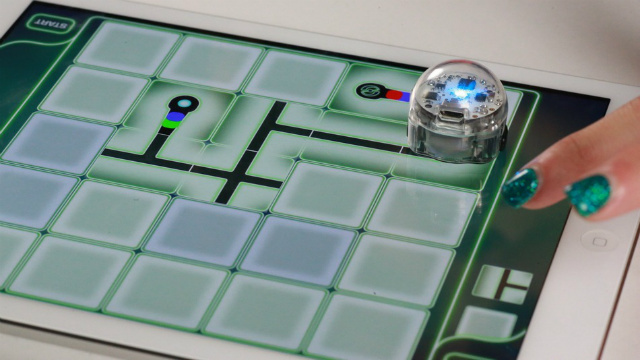 Ozobot, a game-playing robot, wants you to get physical with digital games — and it could be on to something. According to a recent study by the Entertainment Software Association, more than half (58%) of all Americans play video games, which may lead some to believe that fewer people are playing physical board games. On the other hand, the same study says 34% of online gamers play puzzles, board games, game shows, trivia and card games, which suggests many still yearn for some old-school gaming. These findings could help explain the motivation to develop a product like Ozobot. It’s a tiny, one-inch-tall robot designed to work on top of tablet and smartphone screens, as well on as paper. What's more, it will follow both digital and physical lines that players draw on the fly, and can even reportedly tell the difference between a digital and physical surface. “We set out to breathe new life into game night –- that experience which, as an individual or as a group of friends –- has become a bit tired and repetitive between board and video games,” said Nader Hamda, CEO of Ozobot. Unveiled at the 2014 International CES in Las Vegas, the motorized rolling robot uses light sensors in its base to read digital screens and other surfaces. The idea is that Ozobot melds the digital world with the physical, playing interactive games with the screen and with other Ozobots. At launch, Ozobot will work with a number of downloadable mobile apps (iOS and Android) that the company developed: OzoLuck, OzoDraw and OzoRace. The last game will include a physical track, on which up to two bots can race around at up to 3-inches per second. Ozobot is also working on a dev kit so third parties can build new games for the robots. Developers may have their work cut out for them since Ozobot can reportedly recognize up to 1,000 instructions. Each Ozobot will include changeable skins and LED lights, which let players know what the robot is “thinking” or doing. The robots charge via a mini USB port, and each one should run for up to 40 minutes on a charge, according to Ozobot. Ozobot is still in development, and the company is raising funds on Kickstarter. It hopes to ship Ozobot in time for the 2014 holiday season.